Guys can be dirty and smelly. I mean we can be too, and that’s cool, but sometimes it’s a wonder to me that we let them sleep next to us, nuzzle up to us, etc. So for the holidays, we offer you a few authentic, natural ways for him to clean up his act. 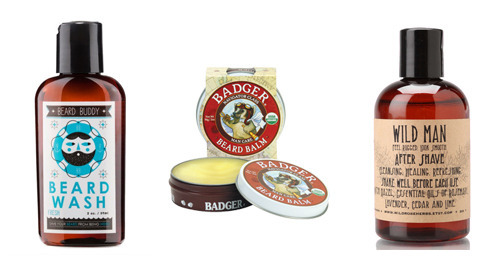 Badger Beard Balm is perfect for the bearded gents in your life (is this everyone? beards are so trending). It is filled with good things such as vitamins A, D, E & F to keep his beard healthy, thicker and cleaner, as well as helping to relieve itchiness as it soothes the skin under the hair. If you’re looking to get rid of this beard, maybe this is not the right angle for your gifting. Further, no one wants to cuddle with a dirty beard - who knows, maybe you already are and are dying for a nice way to help this problem of yours his. Beard Wash made by Beard Buddy. Started in 2011 in California, all Beard Buddy products are “hand crafted by beards for beards.” Both founders have large beards of their own to tame, and wanted to do this with organic products - kudos, and cuddles, to them. Maybe your partner doesn’t have a beard and you are thinking, well great, thanks for the advice, but no beard on my shopping list … have no fear, we have one more great “must give” man gift idea. Wild Rose, which is an Oregon-grown company, prides itself on sustainability and offers up the simple yet brilliant Wild Man After Shave. His face will feel healed and refreshed … and he’ll have a subtle woodsy scent like you just strolled with him through a fair glen.